Who's Coming to Friday's Asia-Pacific Stevie Awards in Hong Kong? The fifth annual Asia-Pacific Stevie® Awards will be presented at Hong Kong's Mira Hotel on Friday, June 1. A sell-out crowd of more than 280 executives from across the region will attend for the presentation of the Grand, Gold, Silver and Bronze Stevie Awards. Winners were announced last month. The Asia-Pacific Stevie Awards are the only regional program to recognize innovation in every facet of the workplace, from management and product development to customer service, human resources, marketing and more. The 2018 Asia-Pacific Stevie Awards have recognized organizations in 15 markets including Australia, mainland China, Hong Kong, India, Indonesia, Japan, Malaysia, Myanmar, Philippines, Singapore, South Korea, Taiwan, Thailand, the U.S.A. and Vietnam. 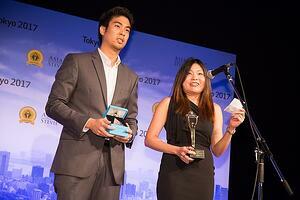 More than 800 nominations about innovative achievements in the APAC region were considered by the judges this year. Entries for the 2019 edition of the awards will open in October. Here is the list of organizations that will be represented at Friday's awards banquet in Hong Kong.